Ask fellow campers about "Las Vegas RV Resort " and nearby attractions. First time staying at this park. Park is clean and services work good except for wifi. I could not get on it but my wife did with her tablet. Pool looks nice. Sites are paved and level. Surrounding is gravel. Sam’s Town Casino is a block down the road. Surrounding area doesn’t look great, but park seems to have good security. We camped at Las Vegas RV Resort in a Fifth Wheel. Have stayed and reviewed this park before. Nightly rate has increased significantly but is still a good value. Paved roads and sites with gravel elsewhere...no grass. This time we were 25' from the dog park...very noisy. Srvices work as designed except for wi-fi that is pretty much useless. 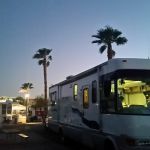 We camped at Las Vegas RV Resort in a Motorhome. This was our 3rd whole month of March staying at Las Vegas Resort. The staff goes above and beyond in caring for you and your needs. The shower rooms are LARGE and clean! The pool is spacious. The grounds are always clean and sites are well cared for. If you do not have children, this is the place to stay. 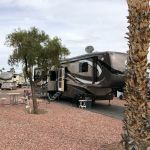 We camped at Las Vegas RV Resort in a Fifth Wheel. We have not submitted reviews for a while since we return to our usual spots; however, we had a reason to visit Las Vegas recently. We chose this resort based on the great reviews and location. We were extremely disappointed. Positives-overall the park was clean and staff was friendly. Now the negatives-1) The Tengo WiFi was terrible. 2) We appreciate rules but this park was extreme. There seemed to be a double standard on many rules. For instance, RVs were not to be over 15 years old. There were plenty older than that. Some permanent looking trailers looked more than 20 years old. 3) Rules state sites must be free of clutter. Site 302 was a dump--breaking almost every rule. It was an eyesore for the view of those paying for upgraded sites. We saw 3 or more 24 packs of water stacked, bleach type bottles, an old tube TV, empty planters stuffed at back of trailer and more junk we could not identify without staring. The trailer next to them wasn't much better and the 5th wheel behind them had a freezer about 3'x3' outside. 4) Sites were very small. 5) RV'ers were not friendly. We felt like we were being watched constantly. A lady scolded us for using the larger pet run for our small dog even though no other dogs were around. 6) Our biggest complaint was the pet area. Pets must relieve themselves in the designated areas. We had to carry our dog to the area as we were afraid our dog might not wait. Within 36 hours of using the pet area, our dog was vomiting and had diarrhea. For 2 1/2 days we struggled to find out what was wrong then we noticed a lady spraying something in the pet areas. We asked what she was spraying. She got defensive and told us the spray was "environmentally-friendly" else the trees would be dying. We immediately bathed our dog and set up pet pads in our RV and did not let her out again. It took another 3 days before our dog was better. Maybe most dogs can tolerate their daily spraying of chemicals but our dog did not. We would never stay here again. We camped at Las Vegas RV Resort in a Motorhome. We have stayed at this park at least a week, twice a year and now find that it is going downhill. One thing that really upsets me is that the park does not update their wifi and although they advertise that they have wifi, it is practically nonexistent unless you are in the office. It is an embarrassment to the park and on top of that, you get a note to tell you that if you are caught running movies, etc, you will be kicked off the net. Get with the program Las Vegas and get up to date. We camped at Las Vegas RV Resort in a Motorhome. A real city park, lots of asphalt, lots of city noise, but great value and location. if you want more space you need to take a premium site. otherwise your neighbors are very close. Employees are amazing and go the extra mile for you. we had to extend our stay three times because of government shut down (closed natl. parks), but they did a great job at the office to make everything possible and we could stay at the same site. Clean laundry, good washers and dryers. we would go back anytime. 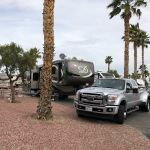 We camped at Las Vegas RV Resort in a Fifth Wheel. We enjoyed the areas around Las Vegas a lot more than the city. Red Rock, Valley of Fire, Lake Mead NRA, are great for hiking etc. A highly recommended RV resort. We are a German couple and with our Motorhome on discovery trips in the USA. Now we are visiting this RV Resort for the sixth time and are always happy to be here. The well-kept place, the spacious spots, the clean sanitary rooms, the nice pool and the always very nice and helpful staff make the stay very pleasant. We will gladly come back in June 2019. We camped at Las Vegas RV Resort in a Motorhome. 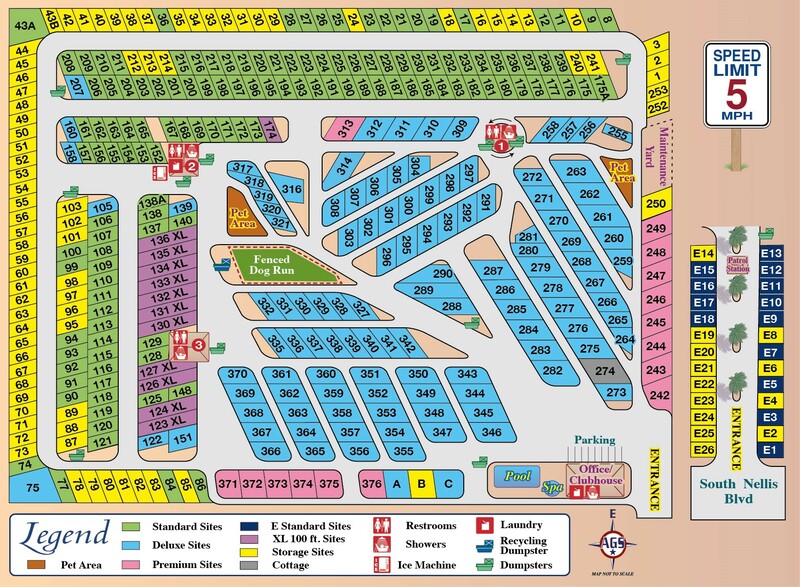 The RV park is within walking distance of Sam's Town and just north of the Sam's Town RV park. The park is gated with someone at the gate to check people that come in. It was clean and well kept and the people were very nice. The pool and spa were very nice. The roads are a little tight although we did not have an issues with our 39 foot RV. You will want to unhook your toad as you come into the park. We got a pull through site but because of the location of the utilities, you need to park near the back of the site so you cannot keep the toad connected. The dog walk area was very nice. The wifi worked very well. They give you a physical key to use at the pool and rest rooms - you pay a deposit for the key that is refunded when you give it back. The site was a hard surface. There was adequate spacing between the sites but a little more room would have been good. We had to park on the one side of the pad so we could have the slide out. There are some park models interspersed in the park. We would go there again. We camped at Las Vegas RV Resort in a Motorhome. It was our first time at this resort. For Las Vegas, this resort is the one we like best. We like the security and the overall organization of the park. Pets are well controlled, really nice dog runs. The streets are well maintained, no trash anywhere. They have a well designated one-mile walk that we used twice daily. The pool is clean, nice clubhouse and the people at the front desk are very helpful. Good location, close to freeways and Samstown, the Wetlands Park, Boulder City etc. Every guest we met was cordial. We will return and stay longer the next time. We camped at Las Vegas RV Resort in a Motorhome. Costco is about 20 minutes away, Walmart is jus down the street. Hair salon at Samstown is better than average but reasonable for Las vegas. Nice, clean and secure campground right in Las Vegas. We needed something close to the airport as we were flying to the East coast for Thanksgiving to visit family. They have many amenities and a 24 hour staffed security gate at the entrance. Friendly staff. Many seasonal campers here but all were nice. Sites are pretty tight but you're in town so it's going to be a bit crowded. Parking for the truck was tight. We camped at Las Vegas RV Resort in a Fifth Wheel. It is in the middle of this expensive city, Walmart & restaurants are close by. Plenty of Dig Parks, lot of permanent residents. 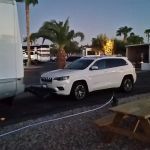 We camped at Las Vegas RV Resort in a Travel Trailer. This was our second time staying at this park. We wanted to have a pull through site in the "more landscaped" portion of the park, but those were all booked 3 weeks ahead of our stay. We were assigned a back-in completely asphalt site near the back of the property. These apparently have been converted from storage sites due to increased demand for the park. Therefore, I recommend earlier reservations to have a better choice of sites. Apparently one problem was a large automobile show the week we visited. Backing into the site was a somewhat tricky, but the man who escorted us there upon check-in knew his stuff and guided us into it with little problem. Sewer connection at back of site, electrical pole at back of site. The park is well run and has good security. We will return. We camped at Las Vegas RV Resort in a Fifth Wheel. To get around town, use the free shuttles at Sam's Town to the strip and to downtown. Sam's Town is half a block away and has free parking. Nice park, feel safe with security patrolling 24/7. We camped at Las Vegas RV Resort in a Travel Trailer. Our 4th stay here, love the staff, amenities, very clean. Will always be our 1st choice. Great pool and spa. We camped at Las Vegas RV Resort in a Motorhome. We used this park as a place to visit many areas all around the area. This worked well for us. Great personal, all very friendly. WiFi was kind of iffy most of the time. I appreciate the guard gate at the entrance. Verizon service was very good. Very quick and easy check in process. Escorted to the site and hookups quickly completed. All interior roads are paved and this is an adult park only. We camped at Las Vegas RV Resort in a Motorhome. Close to shopping, restaurants, casinos, few mile from the strip. There is a great pub with food just North of the park, less than a block. But it was 107 degrees at 5:30 pm and my wife refused to walk up there.... so snacked and drank in the rig. Next to Sam's Town. Close to town, stores, and the strip. Sam's Casino and Wal Mart just west on S. Nellis. Blueberry Hill Pancake House was our choice for breakfast. You need to unhook when you register. We had plenty of room to park our 40' Motorhome and car in front since hookups are at the back of lot. Close to Walmart superstore and Sams town. Water available at park. We were here for 2 weeks. Sam's Town is 3 blocks away; great buffet, best to drive there instead of walk. WalMart is across street from Sam's. We used 'Uber' to see the local popular sites, as even self-parking had hourly fees. Sam's Town Casino is with in walking distance, as is Walmart. I would not suggest that one venture outside of the park on foot. Close to Sams Town and their free shuttle to the strip and downtown. Gated and manned 24 hours along with patrols at night give a feeling of safety. Located in a questionable part of town. With every big city, you have all the services you need nearby. We needed to have a roof repair done and were able to find someone to come to the campground to do it on a Saturday. About seven miles from the strip. Great location to tour Las Vegas and Hoover Dam. Very nice campground, would definitely stay there again. Try John Mull Meats and the Road Kill Grill for some really good BBQ. It is located in North Las Vegas. Was featured on an episode of Diners, Drive-ins and Dives. Close to Sam's Town which has a shuttle bus that takes you to the strip. Free parking in their covered lot so, since they charge you for parking on the strip. this is the best deal all week. Their buffet was also a lot cheaper than on the Strip. Hey, it's Vegas, enough said! Plenty of everything for your entertainment, whatever that may be. The Fremont Street scene shouldn't be missed, people watching at it's best. Hugo's Cellar at The Four Queens is an upscale, old school restaurant that is pricey, but very good, with excellent service. We took a guided tour of Hoover Dam, ubered to downtown to the Golden Nugget for pick up and back- no parking problems with a large truck. The roads through the park can be kind of narrow...but there are plenty of big rigs in there...just need to be careful. You can walk to Sams Town and catch free shuttle to Strip or Downtown. It's Vegas. You probably already have this figured out. Don't neglect the wonderful things to do outside the city: Lake Mead, Mt. Charleston, Hoover Dam, Valley of Fire State Park, Red Rocks, etc. Also, the Ethel M Chocolate Factory tour and cactus garden are fascinating if you're into this type of exploring as we are. Make sure you check out Valley of Fire! Very close to the Las Vegas Speedway. Great racetrack. You don't need me to list Vegas attractions. Easy walk to Sam's Town Casino to enjoy the buffets. We drove 20 minutes to Viva Zapata restaurant in North LV based on recommendation from a foodie website. Completely worth the trip. This park is about 7 miles from the strip, however once you are on Flamingo Rd, it is one straight road to Las Vegas Boulevard. Sam's Town is about a 10 minute walk. This is Vegas! What else can I say!!!!! Lots of things to do on the Strip with The Bellagio, Venetian, & Wynn hotels/casinos among our favorites. There are a few state parks and nature preserves within fairly close proximity worth going to. A nice day trip down to Hoover Dam along with hiking the old railroad trails is a fun day. If you like AAA baseball, they have the Las Vegas 51's. The downtown Freemont Experience is great at night with an awesome light show each hour, but watch out for your safety. See all Vegas has to offer from this park. You're in Vegas. You figure what to do! Not real close to the "strip", which can be a very good thing depending on your reasons for being in Las Vegas. Easy access to the strip (24 hr bus pass $5) 8 minute walk to direct bus #202 drive should be less than 20 minutes, with evening road construction more like 35 minutes heading back. The strip bus runs every 30 minutes and runs late. Buy last minute show tickets and save 50 %. You can also use free shuttle from Sam's which is 3 blocks away, but does not run late. Close (5 miles) to the Vegas strip and Fremont experience--fairly easy to drive to either and park. Stores very close by. If you're too late for the free shuttle from the strip to Sam's town and you think 40 of 50 dollars for a taxi is too expensive, take bus 202. It goes 24 hours a day. Buy a dayticket for 7 dollars, you can use that ticket aso in the buses on the strip. Convenient to downtown Las Vegas. Make sure you lock up your bikes and coach. There are a number of RV parks in this part of town but it's not the best of neighborhoods. Not a place to go walking about after dark. Easy walk to Sams Town, but area not so nice at night. They have 24 hour security so you feel safe. 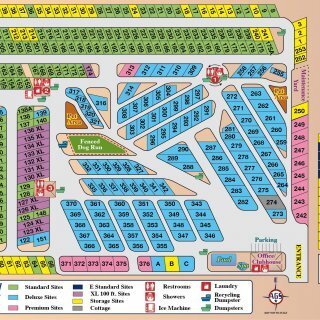 Are you affiliated with Las Vegas RV Resort ?